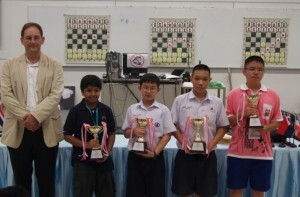 A very well organised tournament, featuring 67 Thai and international children aged 10-17, concluded successfully on Sunday. 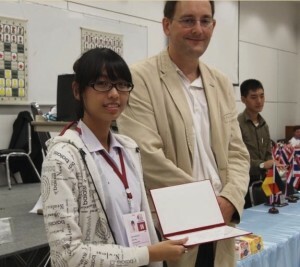 Grandmaster Gerhard Schebler was on hand to award the prizes. The largest group was the under-12s (36 players), showing immense powers of concentration and generally good discipline. This bodes very well for chess in Thailand. Although there were typically few girls competing, Worasuda Atthaworadej was outstanding in the under-12 group finishing second with an unbeaten 4.5/5. In the under-18s, Thanadon Kulpruethanon produced some excellent chess, winning all his games. Also playing well was the 17 year old Thai girl, Ruja Pichayarom, finishing in third place with 3.5/5. Congratulations to FM Jirapak, the tournament organiser, Thai-Nichi College for providing the venue, and Chess4thai for sponsorship.